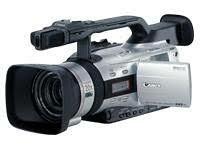 Both of our video cameras record onto mini-DV tapes – to download the footage, you will need a firewire port on your computer. If you don’t, we have a laptop you can hire at half-price with the video camera which has one. We also have a computer in the Centre which has a firewire cable. Please ask us if you require either of these options. Firewire or IEEE 1394 port on your computer.